we don’t need to write code on JS , XML , HTML etc we can add controls by using Annotation file . here you can open 3 way. here you can chose function what you want add on smart template project. here you have to select controls according to your req. So it was just a example . And thanks u very much in advance! or follow this Blog Manage Smart Template (List View and Object View ) using Annotations file… you will get everything. when I add the button, all the columns and data can’t load by following the ways above. I am trying to build an overview page and added some Analyitcal cards on that. Now I am looking for how I can put Navigation so that user can go to a Master Detail App while clicking the card. Could you please enlighten how to do this? can you also suggest how can we replace the text on the button with an icon, like “add” or other sap icons? Thanks for the tutorial, it was very helpful…. I have created the same application using annotation but on my header there is action buttons initially there not enabled but the moment is click on some another button those action buttons gets enabled. Kindly check in the above screenshot : initially when i land on the page and click on the action button, the buttons are coming as disabled but when i click on Copy button which is on the header and navigate back to this page then it gets enabled. Since i have not specified in the press event, i am not able to make those button enabled initially. Is this Buttons are Custom button (Breakout/Extension ) or Action button (data field for action ) ..????? I had created an annotation , however, i could see radio button after each line item which im not expecting. kindly let me know how to remove the radio button from each line item. Initially i had created the app in splash->build(prototyping tool) and then imported to webide. 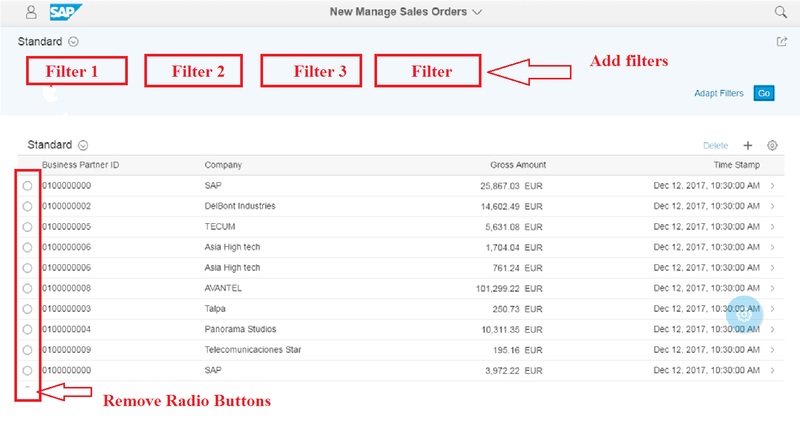 When im running with mock data , i could see the filters and object page(page 2) but when im binding the data with Northwind or ES4 odata, filters are not displayed and object page is empty . Please find attached screen shots for reference. kindly look into this and advice accordingly. Sorry for Delay . Did you get your Solution ? ?